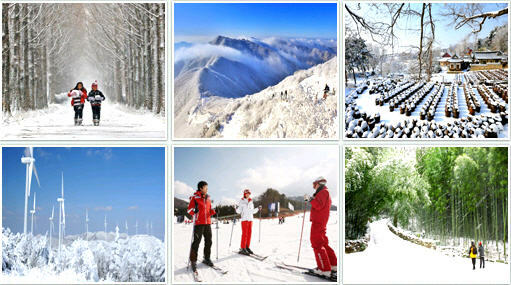 KOREA WINTER, the Season of Snow : When Snow in Korea? Korea is geographically situated in a temperate climate zone at medium latitude. As a result, it has four distinct seasons. In general, spring is from March to May, summer from June to August, autumn from September to November, and winter from December to February. The weather in spring and autumn is clear and dry due to the influence of anticyclones; summer is hot and humid due to Korea's location on the North Pacific Edge; and in winter, continental high pressure brings cold and dry weather. Q> I want to bring my young daughter to Korea to play with snow in December. Would there be snow during that period? Serious answers please. A> In the years that I've been in Korea, it has snowed more often in January and February than December. Snow is possible in December too, but of course no guarantee. So you should either stay in Korea for the entire month or go to Yong-pyung Ski resorts and mountains located on the eastern part of Korean peninsula. Yong-pyung is really great for skiing and snowboarding! Q> Is there snow during november in Seoul, Korea? A> Probably no. Seoul gets its first snow of the year in late November but it melts away almost immediately. You'll get real snow from December through early March but Seoul does not get that much snow considering its freezing weather. (Seoul is very dry-cold in the winter!) 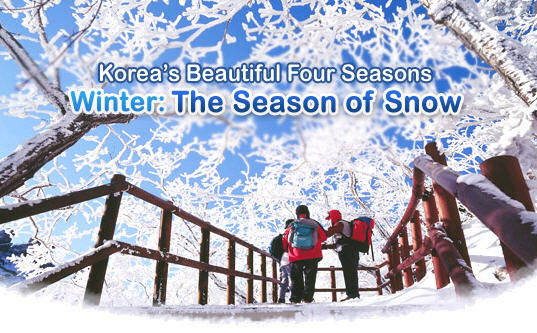 If you visit Seoul in January and stay for two weeks, you'll definitely see a snowfall at least once but not likely in November. So if you really want to see the actual snowfall, visit Korea in January and instead of staying in Seoul, visit Ulleungdo(an island located east of Korean peninsula!) It snows almost everyday in Ullengdo in January and is a nice tourist spot. Winter in Korea is usually between December and February, with the average temperature in January, the coldest month, ranging between minus six degrees and three degrees Celsius. The days with the lowest temperatures in the winter are usually between the middle and end of January. In winter, the days are shorter with the sunrise occurring later and the sunset occurring earlier. Usually, a cycle of three days of cold weather followed by four days of warmer days (samhansaon*) is repeated. The mountainous regions in Gangwon-do receive snowfall starting in early winter, with the weather being very cold and dry due to the wind blowing in from Siberia. Major holidays between the months of December and February are Christmas, New Year, and Lunar New Year, and the months of February and early March are the time for graduation ceremonies and the start of school. In rural areas, arable land is left to rest until farming resumes in the spring while some vegetables are grown in vinyl greenhouses. A unique practice in the winter between November and December is gimjang, which is the preparation of large quantities of kimchi to eat throughout winter. KOREA SKI TOUR © 2009-2025 All Rights Reserved.